Relational maintenance provides a rallying point for those seeking to discover the behaviors that individuals utilize to sustain their personal relationships. Theoretical models, research programs, and specific studies have examined how people in a variety of close relationships choose to define and maintain those relationships. In addition, relational maintenance turns our attention to communicative processes that help people sustain their close relationships. In this collection, editors Daniel J. Canary and Marianne Dainton focus on the communicative processes critical to the maintenance and enhancement of personal relationships. The volume considers variations in maintaining different types of personal relationships; structural constraints on relationship maintenance; and cultural variations in relational maintenance. Contributions to the volume cover a broad range of relational types, including romantic relationships, family relationships, long-distance relationships, workplace relationships, and Gay and Lesbian relationships, among others. 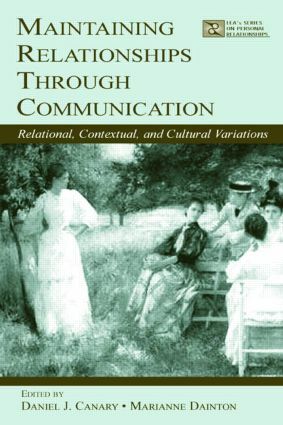 Maintaining Relationships Through Communication: Relational, Contextual, and Cultural Variations synthesizes current research in relationship maintenance, emphasizes the ways that behaviors vary in their maintenance functions across relational contexts, discusses alternative explanations for maintaining relationships, and presents avenues for future research. As such, it is intended for students and scholars studying interpersonal communication and personal relationships.